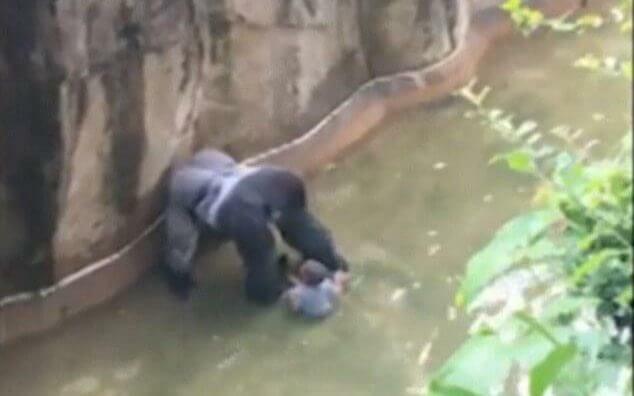 A 180 kilogram male gorilla in a US zoo has been shot dead after grabbing a four-year-old boy who fell into a moat. Authorities said the boy, who fell three to four metres, is expected to recover after being picked up out of the moat and dragged by the gorilla for about 10 minutes. The boy is currently in Cincinnati Children’s Hospital Medical Center, where he is expected to make a full recovery. Zoo Director Thane Maynard said the response team decided the boy was in “a life-threatening situation” and that they needed to put down the 17-year-old male gorilla. Mr Maynard, however, mourned the loss of the gorilla, which came to Cincinnati in 2015 from the Gladys Porter Zoo in Brownsville, Texas. He said in a news release: “We are all devastated that this tragic accident resulted in the death of a critically-endangered gorilla. Two female gorillas were also in the enclosure when the boy fell in but zoo officials said only the male remained with the child. Mr Maynard said the gorilla didn’t seem to be attacking the child, but he said it was “an extremely strong” animal in an agitated situation. He said tranquilizing the gorilla wouldn’t have knocked it out immediately, leaving the boy in danger. It was the first time that the team had killed a zoo animal in such an emergency situation, Maynard said. He called it “a very sad day” at the zoo. The area around the gorilla exhibit was closed off Saturday afternoon as visitors reported hearing screaming. Mr Maynard has stressed the zoo believes the exhibit remains safe.